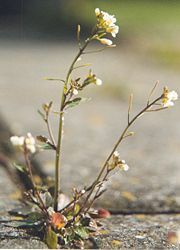 The Thale Cress (Arabidopsis thaliana) is regulated by blue to UV light. Phototropism is the growth or movement of a sessile organism or a component part of the organism toward or away from a light source. While it is most commonly used in reference to green plants, this phenomena is known in other organisms, such as fungi (Jost 1907). Growth or movement towards a light source is a positive phototropism, while growth away from a light source is called negative phototropism. Positive phototropism is common among the shoots of higher plants, while roots usually exhibit negative phototropism. The growth or movement of an organ towards a light source was originally known as heliotropism, or bending toward or away from the sun, but was renamed more generally phototropism when it was recognized that this phenomena also occurs in response to any light, including artificial light (Ray 2001; Firn and Digby 2001). Phototropism reflects a remarkable harmony between plants (or fungi) and their environment. As sessile organisms, plants cannot walk toward or away from various environmental stimuli. However, phototropism allows the plants to "move" harmoniously in response to the direction of sunlight, just as other tropisms allow the plant to move or grow towards water (hydrotropism) or in the direction of gravity (gravitropism). Phototropism is one of the many plant tropisms. A tropism (from Greek, tropos, "to turn") is a biological phenomenon indicating growth or turning movement of a biological organism, usually a plant, in response to an environmental stimulus. For example, geotropism is a turning or growth movement by a plant or fungus in response to gravity. Chemotropism is a movement or growth in response to chemicals. Hydrotropism is a movement or growth in response to moisture or water. Phototropism is generally described as that phenomena dealing with a directional plant growth or movement in which the direction of growth is determined by the direction of the light source. It is usually differentiated from heliotropism, which is movement or growth in response to sunlight, in that phototropism refers to any light source, including artificial light. Each organism, or part of an organism, can have one of three conditions with respect to light: towards a light source (positive phototropism), away from a light source (negative phototropism), or indifference (Jost 1907). Most plant shoots exhibit positive phototropism, while roots usually exhibit negative phototropism, although gravitropism may play a larger role in root behavior and growth. Some vine shoot tips exhibit negative phototropism, which allows them to grow towards dark, solid objects and climb them. Various parts of certain fungi, such as the sporangiophores of Phycomyces, or the stalks of the fruits of Peziza fukeliana, also may be positively phototropic (Jost 1907). Some roots of green plants, such as Allium sativum (garlic), also have exhibited positive phototropism (Jost 1907). Phycomyces, a fungus, also exhibit phototropism. Phototropism in plants such as Arabidopsis thaliana is regulated by blue light receptors called phototropins. Other photosensitive receptors in plants include phytochromes that sense red light and cryptochromes that sense blue light. Different organs of the plant may exhibit different phototropic reactions to different wavelengths of light. Stem tips exhibit positive phototropic reactions to blue light, while root tips exhibit negative phototropic reactions to blue light. Both root tips and most stem tips exhibit positive phototropism to red light. Phototropism is enabled by auxins. Auxins are plant hormones that have many functions. In this respect, auxins are responsible for expelling H+ ions (creating proton pumps), which decreases pH in the cells on the dark side of the plant. This acidification of the cell wall region activates enzymes known as expansins that break bonds in the cell wall structure, making the cell walls less rigid. In addition, the acidic environment causes disruption of hydrogen bonds in the cellulose that makes up the cell wall. The decrease in cell wall strength causes cells to swell, exerting the mechanical pressure that drives phototropic movement. The amount of light is important. A certain minimum amount of light is needed to trigger the reaction, and if too high of light, there may be an opposite reaction (Sengbusch 2003). Etiolation is the response of a plant when light is nearly (or completely) absent. Heliotropism is the diurnal movement or growth of organisms or parts (flowers or leaves) in response to the direction of the sun. Photonasty involves the movement of plant parts that does not involve growth but is triggered by light. The plant movement is not determined by the direction of light so it is not a phototropism. Photonasty in prayer plant (Maranta leuconeura) involves the downward movement of leaves when they receive light in the morning. Phototaxis is movement of an entire organism in which the direction of movement is determined by the direction of light. It occurs in some motile microbes such as Euglena and algae. Photo-orientation occurs within a plant cell when chloroplasts change their positions depending upon light intensity. This was discovered in 1987 by Chelsea Polevy and Kelsey Joyce when experimenting in their laboratory. When the light intensity is high, chloroplasts move to the edge of the cell to reduce photobleaching (destruction of chlorophyll) (Takagi 2003). In low light, chloroplasts tend to spread out within the protoplasm to maximize their capture of light energy. Photo-orientation is also not a phototropism. ↑ Phototropism: From Photoperception to Auxin-Dependent Changes in Gene Expression by Emmanuel Liscum, University of Missouri. - Plant Physiology Online. Retrieved January 6, 2008. Berthier, S., and A. Stokes. 2005. Phototropic response induced by wind loading in maritime pine seedlings (Pinus pinaster Ait.). Journal of Experimental Biology 56(413): 851-856. Firn, R. D., and J. Digby. 2001. Phototropism: What is it for? Epress. Retrieved January 6, 2008. Jost, L. 1907. Lecture on Plant Physiology. Oxford: Clarendon Press. Ray, C. C. 2001. Q & A: Hillside trees The New York Times, March 13, 2001. Retrieved January 6, 2008. Sengbusch, P. V. 2003. Phototropism University of Hamburg, Department of Biology. Retrieved January 6, 2008. Takagi, S. 2003. Actin-based photo-orientation movement of chloroplasts in plant cells Journal of Experimental Biology, 206: 1963-1969. Retrieved January 6, 2008. Thiers, G. 2002. Phototropism eSSORTMENT. Retrieved January 6, 2008. This page was last modified on 2 April 2008, at 14:16.